"Too Long Didn't Read" Summary: Managing too many messaging apps can cause cognitive overload. It's smarter to focus on the one system that works with everything everywhere there's internet. I've been using electronic text-based messaging on computers, phones, and other devices since the 20th century. Back then, I kind of expected society to consolidate our messaging capabilities on something standard and interoperable yet robust and flexible like we did with voice telephones, the world wide web, the postal system, and roads. Almost 20 years into the 21st century, and that hasn't really happened. In fact, personal communications seem to be more fragmented and segregated than ever! If you've got a smartphone, you probably use some variety of electronic text-based messaging apps and protocols. Of course all phones come with a "text messaging" app that handles SMS and MMS. Some such as Apple's iMessage add in another propietary internet-protocol-based messaging method. And then there are dozens of other internet-protocol-based electronic text-messaging apps out there that many people use. You've got WhatsApp, Line, Telegram, BBM, Google Chat, Allo, Hangouts, Skype, Viber, WeChat, Signal, Kik, LiveProfile, Facebook Messenger, Tencent QQ, AIM, iChat, iMessage, Riot, Yahoo, ICQ, GroupMe, Vkontakte, Mail.Ru Agent, Odnoklassniki, Yandex chat, Mamba.Ru, Mig33, SINA Weibo, Renren, Fetion, Gadu-Gadu, MeinVZ, Jabber, etc. Type a message as electronic text, press send, it goes to the other person. Wouldn't it be nice if we had one consistent way to do that? Something that would work on all of our devices at all times? Something that would sync our conversations and allow us to flag them for action items, create calendar appointments, schedule responses, categorize conversations based on topics, and sort things out in a variety of robust ways? We already do have a single consistent and fully open protocol for sending electronic text-based messages over the internet. It's called email and it can work really well if you learn how to use it. Yeah, that's the problem! We need to teach society how to be smarter about electronic text-based messaging. We need to avoid the myriad of messaging apps that are made to take advantage of us and demand the features that maintain our freedom and interoperability on the internet. Okay, there is one other electronic text-based messaging system that's still pretty popular and fairly interoperable. SMS text messaging was great 20 years ago when mobile phones didn't have any internet access whatsoever. You could easily send short text-based electronic messages through the mobile phone networks. Today, SMS/MMS has severe shortcomings. It doesn't work well with attachments. It doesn't support text formatting. It can't handle text or image embedded hyperlinks. There are no calendar or task list integrations. Some carriers still charge you money for it! A big disadvantage of SMS is that it only works on one of your phones at a time. Tech reviewers and enthusiasts like me tend to switch phones pretty often. When that happens, all of the SMS conversations remain on the old phone and you can't see them anymore. They don't sync with other devices. Well, okay... sometimes there are ways to get those SMS conversations to transfer to other devices. If your phone runs iOS and your computer runs macOS, you can get those SMS messages on your computer too, but Apple implemented this in a propietary way in order to basically lock you in to using Apple products. The smarter option is to, of course, use a messaging protocol that can't be taken hostage for the purpose of corporate greed. The only real advantages to using SMS text messaging is that it sometimes works over the cell networks even if your phone doesn't have internet access. So if you're using a feature phone from 20 years ago or you're in an area with poor mobile internet connectivity and no WiFi, then yes I can see why you would want to be using SMS text messaging. SMS/MMS is slated to be replaced with "Rich Communications System", a new standard for sending electronic text-based messages between phones. This new system will use the internet protocol too, just like email, except everything will be routed through your mobile phone carrier so that they can charge you for it. That probably won't work on internet connected devices that aren't associated with your carrier and it probably won't work on more than one phone at a time. Nor will you be able to create free "aliases" to give out to spammers while keeping a "personal" address for actual people you want to talk to. Once all those marketing robots get your phone number, your only choice is to change phone numbers completely and deal with updating everyone that you want to communicate with. The smarter option is of course to just use email since that has been using internet protocols the whole time. Just as every phone comes with an SMS/MMS text messaging account (if you paid for it), all modern internet-connected consumer-electronic devices basically require an email account to use them. You can't download apps from the Apple App Store or Google Android Play or the Windows Store store or the MacOS Store unless you have an email account set up on the device and associated with those stores. Sure you can create a new Apple ID or Google ID account, but guess what... that's going to be an email account on your device, and that's totally fine. Email is the identity standard for being on the internet. The big advantage here is that every device with internet access has email already. You don't have to pay for text messaging. By default, emails pop-up on the screen as notifications in the same way that SMS text messages and any other messaging app does. There's no actual reason to use SMS text messaging or any other 3rd party messaging system as long as you have internet access. The other big advantage here is that the email account that's already on your phone can also be used and accessed on all other internet connected devices simply by logging into it either within any email app or any web browser (if your email service offers web mail). Other instant messaging apps sometimes try to do this with convoluted secondary apps that may or may not work, but email has been working like this for 30 years or so and it's much more reliable. What's really rediculous about this is that you're required to have an email account in order to download and install other electronic text-based messaging apps from your smartphone's app store. Where else do we use something we already have to buy something that does practically the exact same thing as what we already have? How many people have 2 microwave ovens in their kitchen? What's the point of that? 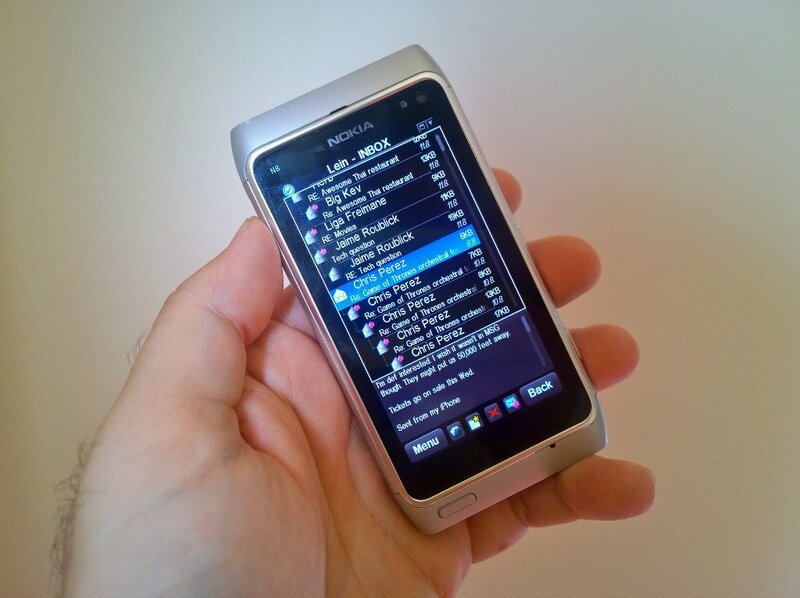 My Nokia N8 from 2010 can sync my email conversations from today even though barely any of the other cloud-centric apps work at all and the operating system has long been discontinued. Practically any electronic device with Internet access (past, present, and future) can do email just fine. There are hundreds and hundreds of apps and programs available to use with your email. Of course you only need one (on each device you use), but with so many options available, you have the flexibility to choose one that works really well for what you want to do with it. Maybe you want messages to be threaded like a chat dialog? No problem, Hop Mail does this really nicely. That one also adds some instant messenger style extensions to email like end-to-end encryption, voice messaging, typing indicators, and read reciepts. Office 365's Outlook has a conversational IM style view, too. Maybe you want snoozing, scheduling, and email archiving features? No problem, lots of apps have that. Maybe you want to color code emails based on categories or keywords so that you can visually differentiate between them and reduce the amount of cognitive energy needed to process communications? No problem, Outlook for Windows has had those capabilities for decades. If you don't like the default email app that comes preinstalled on your device, it's easy to install a different one. For example, if you have an iPhone which still doesn't support instant push recieving of emails on IMAP servers (such as Gmail), you can install Outlook for iOS or Google Inbox and easily get those emails instantly. Furthermore, you're not a slave to the whims of some company that owns your email. You can switch email programs anytime. You have complete freedom to use that electronic text-based communications service as you wish! SMS text messaging, WhatsApp, Facebook Messenger, etc. have none of those luxaries. If WhatsApp decides to stop working on your phone (like it sometimes does and will again), then you're out of luck. If you wish you had automatic replies in Facebook Messenger, sorry, you're out of luck again. In all these cases of propietary instant messengers, you'll always be stuck with the poorly made or restrictive apps the central company decides to give you. That's no way to live! Although, if you're using Android, you can choose different SMS apps, but they all have the same limitations of SMS and are often filled with advertisements. Trying to remember which people prefer to use which electronic-text-based communications systems can become a huge hassle and burden. Successful and very smart people often wear the same outfit every day. The reason for this is that deciding what clothes to wear takes up some small amount of cognitive energy that could be better spent doing more important things. The same is true with electronic messaging systems. Instead of simply typing a message to your friend and pressing the send button, you have to spend some cognitive energy trying to remember which messaging app that friend prefers to use, then switch to that app, find the message thread, THEN you can pick up the conversation. If you want to go back and reference or search for something in some conversation you had with someone, you have to spend more cognitive energy trying to figure out which app and which service that conversation took place in. You'll be lucky if that app even has a functional search, and you can imagine how much cognitive energy you'll have to spend looking for it. Managing dozens of electronic messaging apps is a great way to waste your time and reach cognitive overload. If you ever need to switch phones, good luck getting all of those gabillion conversations to sync with the new phone. By consolidating all of your text-based electronic messaging into one application (and filtering out the clutter), you're greatly increasing your cognitive ease, and that is an excellent thing to do... not just in terms of time-management and efficiency, but also for your sanity. Okay, I can understand that a lot of people get overwhelmed with email because they often get a lot of spam messages, marketing messages, newsletters, and otherwise unimportant junk. Fixing this is pretty simple. I get zero spam in my personal email account and the reason for that is: I don't give it out to anyone other than actual family and friends that I want to communicate with. I don't publish that address on the internet, I don't use it for ecommerce shopping, not even my bank knows that address. Fortunately/Unfortunately, email addresses are required for doing anything else on the internet and that's how the spammers are going to get you, so the solution is to dedicate one (or two) email accounts as spam accounts. You'll use those for anything on the internet like shopping, Facebook, Twitter, newsletters, app stores, etc. and then use a different one for communications. I know some people who make a totally new email alias for every online shopping site they use. That way they can tell exactly who is selling their email addresses to other marketers. You'll probably have at least one other email account for work. How is having a different email account for personal communications different from using a totally different app for personal communications? Well, you still get the cognitive energy advantage of not having to learn or decide which other communications apps to use. You still get the advantage of everything being searchable within one program. You still get the advantage of email being accessible on all internet-connected devices, and you still get the advantage of future-proof flexibility and longevity. Tell all of your friends & family to use the new address to communicate with you. Don't use your new email account for anything other than priority communications. Keep the spam account for all of your ecommerce and newsletter stuff. Check it only when you want to. This is basically the same thing you'd do when your phone number starts getting bombarded with marketing robo calls. Just change your number and tell the important people about the new number. I did this with my email 20 years ago and it has been awesome. My personal email inbox is nothing but messages from friends & family that I want to communicate with. Maybe your email is still bombarded with lots of real messages that you need to read and respond to and that's overwhelming because there's just too many of them. Well, installing more instant messaging apps or installing Slack or Microsoft Teams or moving conversations into SMS text messaging certainly isn't going to help that. It'll make things worse because then you'll need to put a lot of cognitive energy into learning and managing those other apps IN ADDITION TO email! It's best to put some effort into learning how to manage your email and keep things simple by sticking to that. Microsoft Outlook on Windows probably has the largest variety of tools to organize email. Firstly it's easy to keep the personal account separate from the work accounts and spam accounts, but within each account I like to create custom views with conditional formatting rules. This way I can color code incoming emails based on who they're from, keywords, categories, etc. So maybe all of my family member emails show up as blue, best friends show up as green, etc. With colors like this, I'm able to visually differentiate between emails without having to actually read the name and subject. It greatly speeds up my ability to process the listing. Of course I do this in my work email accounts too, color coding specific teams or clients and pioritizing accordingly. Another big advantage in using email is that there is no one potentially greedy company controlling it. Email is an open protocol that anyone can use. I can register a domain and create any email account names I want. I can choose any email hosting service I want or even set up my own server. What's more, you can change the email server or services that you're using with your custom domain email accounts at any time. Even on free email accounts like Gmail and Outlook.com you can make as many different email addresses as you want and all of them can send to anyone else in the world. It's a huge amount of freedom and you can "own" your communications in a way that's not possible with carrier-based text messaging or any of those other propietary messaging applications. Maybe I want my "adamlein.com" emails to be hosted on Office 365? No problem. Maybe tomorrow I want to switch it to use Gmail servers. No problem. Maybe I want to build my own Linux server to handle my emails. No problem. It's like owning your own house or car versus renting from someone else or relying on public transportation. It appears there are a lot of misconceptions about the differences between all of the various electronic messaging systems. The BBC published an article about why some people love texting and hate email. People think that email is more for long-form messages or formal, business-like messages, where-as texting is for more fun short messages and emoji. The truth is, email can be used for emoji and animated GIFs and voice messages and embedded memes and short messages just the same as SMS or any other instant messaging app. In fact, that points out another advantage... email can scale up or down very easily. Some people think texting or instant messaging is faster than email. That may have been true 20 years ago when email was delivered by "pull" timers and dial-up modems, but today just about everything does "push" instant email delivery (except for Apple's Mail on iPhone with IMAP accounts.) You can actually measure the speed of your email server using online tools. The response time naturally depends on which country you're sending to, but in most cases it's between a couple hundred and a couple thousands miliseconds, which is hardly slow. Sending from New York to China might take as much as 45 seconds though. All of the "fun stuff" in instant messengers still works in email. Well, unless we're talking about full duplex video calling. Hop Mail is the only email app that does that, and unfortunately there is no reliable open standard for video calling. Also, the "ease of use" in adding fun stuff like emoji, animated GIFs and graphics to email greatly depends on which email app you're using. Another misconception about email is the idea that it is not secure. That may be true if you set up an email server without adding any security options, but that's your fault not the protocol's fault. The truth is, email can be secured in many ways. You have complete freedom to set up and run your own email server. All you need to do is register a domain, plug a computer into the internet (preferably with a business-class internet connection and static IP address), set up all the DNS pointers, and install some email server software. It's even possible to make your own email server using a $35 Raspberry Pi computer. Having your own server means you have a higher degree of independence and control. But of course, you'll need to learn some things about setting up and maintaining it. The point is that you're not tied down to a single company or small handful of companies when it comes to email messaging. Some of the new text-based messaging apps like WhatsApp boast end-to-end encryption for the messages. That's so that your conversations are kept private, although they're still going through centralized servers owned by Facebook, so the trust-worthiness of that is certainly debatable. There are numerous ways to secure email. You can encrypt the entire network connection using Transport Layer Security. Then you can also encrypt each message individually using a variety of methods. 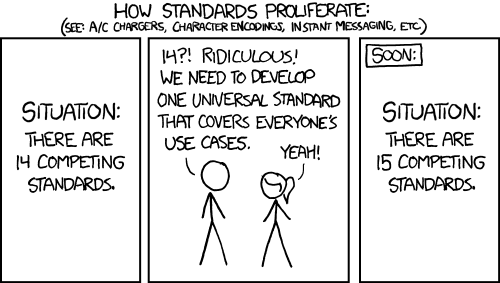 There's GPG, PGP, Mailfence, etc. and some email services like Office 365 and Outlook.com have implemented encyption in the web mail interface as well. The "portal" technique is another way to send encrypted emails and Pauxbox provides another more-user-friendly and HIPAA compliant method of secure email. There are also lots of other email services focused on security like HushMail, ProtonMail, Tutanota, etc. Just be careful with Google's Gmail which tends to read your emails and is blocked in China. If you're a business with a large number of users that need to communicate with eachother, email can be even more secure since you can have you own internal server or set of servers that manages all the internal email communications. You can lock down all sorts of things and keep very specific types of communications from ever leaving your domain. Many cloud services like Office 365 offer all of the legal security compliance features for government and sensitive industries as well. That's certainly not true with 3rd party messaging services like Slack, Whatsapp, and all of the others. A lot of people and companies in China use WeChat, which is a propietary messaging app from Tencent with API's for other companies to integrate with. This is another case of a single company trying to lock you in and control you, but it's also pretty closely tied into the whole country's government which has full authority over censoring your communications. 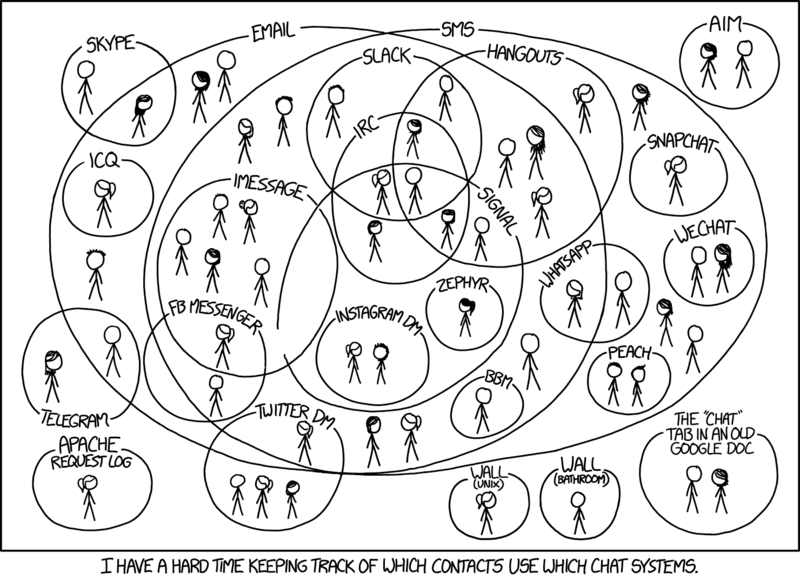 The goal of an instant messaging app like WhatsApp, AIM, Facebook Messenger, Kik, etc. is to gain a large group of users, lock them in to depending on the service, and then use that population to sell advertisements or other services. The same is true with social networking apps like Facebook, Instagram, Snapchat, etc. If they really cared about your ability to communicate with people, it would be something that works with all of the other text-based electronic communications platforms out there and would be based on an open structure that any other company could plug into. We've seen instant messengers do this many times before. AOL Instant Messenger was a big one in the 90's that eventually became riddled with advertisements. MSN Messenger started out being interoperable with AIM, but eventually added dozens of games and animations along with the ads. Skype was bought up by Microsoft and slowly but surely became unusable. All of those popular text-based messaging apps of the 90's are now gone or irrelevant. The same will happen to our current crop of propietary electronic messaging apps. WhatsApp is one of the big ones right now and we're already seeing signs of its eventual failure. The company was bought by Facebook and is continuously losing money. They will probably have to give in soon and start pushing advertisements to its users in order to stay afloat. Also, keep an eye out for companies that pretend to support open standards, 3rd party API's, and external interoperability, but when they get a large user base, they start shutting all of those things out. A good example is how Facebook messenger used to allow 3rd party apps, had an email gateway, and SIP XMPP standards, but removed them all later on. Another is how Twitter used to have great 3rd party app support, but lately they've been shutting all of that interoperability off as well. It works on practically everything that has ever had an internet connection, PCs from the 90s, modern smartphones, tablets, ebook readers, smart speakers, watches, etc. Email is practically a requirement when setting up a new phone, Mac, or PC. (Linux is still immune to email account associations). Instant delivery or scheduled delivery - you can choose! HTML formatting for embedded images, hyperlinks, emoji, animated GIFs, etc. All email conversations sync with all devices where that account has been added (unless you're using a POP server). You can use multiple accounts for different purposes - Example: 1 for family/friends, 1 for work, 1 for spam & online purchasing, 1 for newsletters & social networks, etc. Lots of options for group messaging such as simply adding multiple addresses in the "to" field, carbon copy, or blind carbon copy fields as well as group list server options. Easily reply to all or reply only to the sender. Zero interoperability with other messaging applications. No email gateway, no SMS gateway, nothing. While right now, email seems to be the smartest way to communicate as an internet-connected human society, there is still lots of room for improvement. In the immediate future, I'd love to see extensions to the IMAP standards that add presence capabilities, "typing" indicators, and a standard implementation of read reciepts. A standard method of initiating voice/video calls from within an email hyperlink would be awesome too. Unfortunately voice/video-over-IP is still very fragmented as well. Did you see the Black Mirror "Be Right Back" episode? It was about technology that could reconstruct a dead person's personality and thought processes based on archives of that person's digital communications. It sounds like science fiction, but AI development companies are really working on this. If you're using propietary communications systems like WhatsApp, Facebook messenger, Skype, or any of the other dozens out there, what are the chances of your conversational essence being preserved in artificial intelligence constructs of the future? Not very likely. An open communications protocol that does allow access and exporting to technological systems of the future, on the other hand, would certainly be easier to analyze and create constructs from. I can easily produce emails that I wrote from the late 90's, but maintaining an archive of other communications protocols is much more difficult. If you finish reading this whole thing and still want to use your nameless carrier-hosted phone number as your electronic text-based messaging identity, just about all carriers offer email gateways and email addresses for your phone number's text-messaging account. In most cases, you can use your SMS texting app and simply type an email address in the To field in order to send emails via SMS. If you've realized that it's smarter to use email as your messaging protocol but still need to send SMS/MMS messages to other people who have not learned to use email, that's easy too. This website called freecarrierlookup.com lets you type in a person's mobile phone number and it will return that phone's email address. Some international carriers don't support email-to-SMS gateways, but this is rare. Once you get your friend's phone's email address, just send an email to it and they'll get it as an SMS/MMS text message. When they reply, it will come to your email where you'll have far more management and organizational capabilities than if it were to show up on your phone's SMS app. Some carrier's do weird things to messages sent through the email gateway though. For example, Verizon likes to include the message as an attachment on both ends, which makes reading them much more annoying. Why are we still using SMS?